An interior glass fiber reinforced concrete (GFRC) bench by Stromberg will add to the overall ambiance of any room. Stromberg is a multinational company; they offer custom architectural products in a wide variety of materials, including the popular GFRC. Stromberg pioneered the use of GFRC and they have 30 years of experience in its use. Stromberg offers a huge selection of designs as well as custom design assistance to make sure your GFRC interior benches are exactly what you want. You’ll have more than enough textures, finishes and colors to choose from as well. Interior GFRC benches by Stromberg look good in your home’s entryway or in front of a bay window. 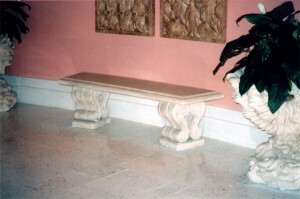 These quality crafted benches can also adorn hotel lobbies, pool and sauna areas, parks and even government buildings. An interior bench made from glass fiber reinforced concrete is functional and will stand up to heavy use no matter where it’s placed. In educational settings, GFRC interior benches are multi-functional pieces of furniture. It provides many uses, and an interior bench crafted from GFRC will stand the test of time. In lobbies, hallways and study areas, benches can help ease overcrowding and add an attractive element. These sturdy benches from Stromberg will be appreciated by your clients in a college or university setting. GFRC is reinforced with glass fibers instead of steel and so is rust-resistant. Glass fiber reinforced concrete is able to stand up to the elements, including moisture and salt air. In our community centers, at parks and playgrounds, churches, train stations and in amusement parks, we’ve all had occasion to make use of a sturdy bench. Choosing a bench from Stromberg means that you can be assured they won’t cut corners in its manufacture; they’ll put their personal touch on your project and the resulting product will serve the community well. The professionals at Stromberg Architectural Products will partner with you throughout the entire process to make sure your finished GFRC interior bench meets your expectations. Stromberg is here to help with CAD details, design assistance and specifications. Contact them today at (903) 454-0904 for your free custom quote, and put their 30 years of experience to work for you.